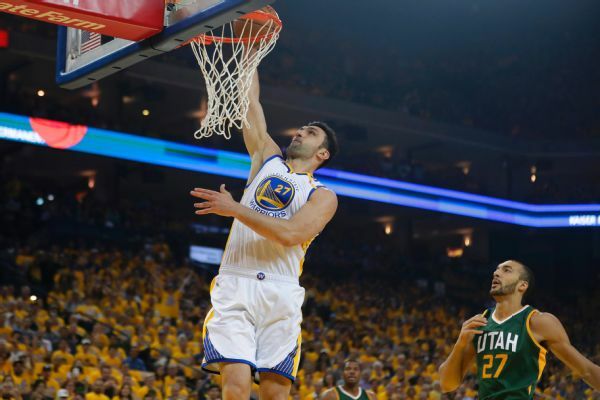 NEW ORLEANS -- Golden State Warriors center Zaza Pachulia did not play in Monday night's 125-115 winover theNew Orleans Pelicansbecause of a shoulder injury. "I don't know what happened to him," Warriors coach Steve Kerr said before the game. "[Head performance therapist] Chelsea [Lane] told me this morning. He had some soreness in [the shoulder]. He warmed up on the floor a little while ago. He said he was still uncomfortable, and we're not going to take any chances." Pachulia joinedShaun Livingston (suspension) in being sidelined for Monday's contest. "Zaza will be out tonight with a shoulder injury so we won't have to make any roster decisions," Kerr said. "We would have had to if everybody had been healthy and Shaun had to be on the active list, or has to be on the active list. So that would have created a little interesting decision for us. But with Zaza being out, there's no repercussions." Kerr gave the assembled media a chuckle when asked who would be starting in Pachulia's place. "I know who's going to start, I'm not going to tell you," Kerr said. "Because again, [Pelicans coach] Alvin [Gentry's] down there, just completely confused about what we're going to do. His head's probably spinning thinking about who I'm going to start. I'm just going to dodge, juke, evade." JaVale McGeeultimately got the starting nod and tallied eight points and four rebounds in 11 minutes of action.